In fact, if you eat enough apple seeds or cherry pits, you could die. Apple seeds contain cyanogenic acids. Cherry pits, and seeds from related fruits, including peaches, plums, almonds, pears, and apricots, contain cyanogenic glycosides. Your body can detoxify small quantities of cyanide compounds. If you accidentally eat a cherry pit in a pie or swallow an apple seed or two, you’ll be fine. Actually, if you swallow several seeds whole, you would absorb a minimal amount of the toxic compounds. Chewing the seeds makes them much more hazardous to your health. Children and pets are much more likely to suffer poisoning from eating the seeds than adults. Symptoms of mild poisoning include headache, dizziness, confusion, anxiety, and vomiting. Larger doses can lead to difficulty breathing, increased blood pressure and heart rate, and kidney failure. Reactions can include coma, convulsions, and death from respiratory arrest. There are several treatment options, but the main thing is to limit the absorption of the chemicals from the seeds. Basically, this means it’s important to seek immediate medical attention if a child or pet is known to have eaten several seeds. Usually, the plan of action is to pump the stomach or induce vomiting. Antidotes are available, but they are somewhat controversial. If you or someone you know eats a seed or two, don’t worry… as I said, your body is well-equipped to detoxify small quantities of cyanide compounds. They naturally occur in several foods. However, if you were wondering whether or not it’s true that the seeds and pits are toxic and potentially lethal… yes, apple seeds and cherry pits are poisonous. How Much Cyanide Is in One Apple Seed? So, you may be wondering exactly how much cyanide is in an apple seed and in an apple. There are about 700 milligrams of cyanide per kilogram of apple seeds. If the average apple seed has a mass of 0.7 grams, then this means there 0.49 mg of cyanogenic compounds per pip. Apples don’t all contain the same number of seeds. You can count them next time you eat an apple, but for the sake of calculating a value, if you assume there are 8 seeds in the average apple, that means you get 3.92 mg of cyanide if you eat them all. It takes around 1 milligram of cyanide per kilogram of body weight to kill a person. So, that’s 70 mg of cyanide or 100 grams of apple seeds to kill a 70-kg adult person. How many seeds is that and how many apples? By my calculation (please feel free to check my math), if there are 0.49 mg of cyanide per seed, you need 143 seeds to reach the lethal dose. At 8 seeds per apple, that’s 17.86 apples. Call it 18. Keep in mind, if you swallow the seeds whole, you’re not going to get the full dose. If you blend them up in smoothies or crunch them up, then you will. Your body detoxifies cyanide, so you’d have to eat them fairly quickly. Also, be aware the calculations are very rough estimates. It takes much less than the lethal dose to make you sick. And, it takes fewer seeds to sicken someone who weighs less or is sensitive to the compounds. For example, a child or a dog would be much more at risk from the toxin. Even so, it’s a lot of seeds. You’d have to go out of your way to just eat apple seeds to get into trouble. Have you eaten apple seeds, cherry pits or peach seeds? Feel free to share your experience. Are you serious? As long as I remember I ate the cherry and swallowed the pit. I grew up in the country. I was never told by my parents both of whom are medical professionals that it could poison me; and I’m very sure they knew about this habit. I still eat the pit and almost never spit it out. Hm something to remember next time I have cherries. From all the reaserch I’ve done this A.M. it look to me as if consuming small amount of such seeds can actually be used as a cancer preventative / cure. Of course our good ole government doesnt want anyone to know about this so they keep the information hidden. I will have to talk to the owner of the local health supplement store to research this further the next time I am over there. I will be looking into this too. If she is right and apple seeds will kill small things like cats and even little kids I’ll bet it will kill other things too. Oddly her list of symptoms seem eerily similar to those presented by chemotherapy patients. I’m sure your local health food store owner is quite the expert on the treatment and prevention of cancer. Best of luck with that. I try to be as aware as possible to the corruption of this world and was made aware of this conspiracy. After further research i found it quite difficult to find the truth about this subject, all information seems to refute the claims, though reading your comment affirmed my suspicions correct! I try to see life with as much reason as possible and cancer seems the kindest form of population control ever conceived. In saying that, In your opinion what dosage or how much seeds should be consumed. obviously cyanide in high dosages is poisonous but what would be a safe amount to consume to help prevent cancers? I just had a bit of an epiphany. Remember that old saying? Folks, THEY MEAN THE WHOLE APPLE. Not trying to sound rude, but cyanide is poisonous to more than cancer cells. Ever heard of the cyanide capsules Nazi officers carried on them? If they were caught by the Allies, they bit down on the capsule to kill themselves before they could be interrogated. Cyanide is VERY lethal and causes a nasty death (as most poisons do), but the amount in apple seeds and apricot pits etc, is very small, almost trace amounts. You are right that you’d be fine to eat a lot of them because, yes, as previously stated, the amount of cyanide is extremely small. Just don’t fool yourself and think it’s not poison lol. i would love to know the absolute truth of it. i train hard. in my younger days iv had quater of a ton plus on my back. but im in my 30s now and il take any healthy gain. but dont be to shocked at the system fibbing to you. never tel the livestock what a fence is for. better they heard together and ocupie each others minds.. its in there interest if we squable amongst ourselves and never look up. but you all know that yeah. what do you do for a living? If you’re not as accomplished as your mom and dad seem to have been then maybe you were effected by eating cherry pits your entire life, Verona. No offense…..
Eric, you are a classic example of scum, saying a comment obviously intended to hurt someone and then saying no-offense… i only heard stuff like that in america. so how do you explain all the folks that have eaten apple and apricot seeds to cure their cancer? it’s my understanding the cyanide is bound and requires a particular enzyme to release it. cancer contains this enzyme so when it attaches to cancer the cyanide is released killing the cancer cells. plenty of people eat these seeds and don’t seem to be dropping dead, in fact, quite the opposite. LOL! what is “quite the opposite” of dropping dead? Returning from the grave? You know my gramma told me to “every once in while” eat the whole apple… core, seeds, and all. they also used to take a hammer and crack open the dried pits of apricots and eat one or two of the seeds … just once in a while…. I think there is some wisdom to their sayings. I also have read about the cancer-fungus connection…maybe this “old wives tale” is a check on the fungus levels in your body..KapoW!#$%^ cyanogenic glycosides a dangerous friend! The cyanide is NOT released in the presence of cancer cells, it is released in your mouth when you break the seed by chewing on it. I have tested this myself, when you first bite the seed it has no taste but if you chew for a few seconds the enzymes in your saliva convert the amygdalin in the seed into cyanide and you can begin to taste the familiar almond taste. Chewing starchy foods long enough has a similar enzyme effect and the starchy food begins to taste sweet as they are broken down into glucose. I don’t know how effective the seeds are at inhibiting cancer but the line about releasing cyanide in the presence of cancer cells appears to be completely false. From what I have read, it takes about half a cup or more of apple seeds to release enough cyanide to kill you. You can safely eat *one* to see for yourself that the almond taste takes a few seconds to appear, but I wouldn’t overdo it. Non lethal doses are definitely not good for you, remember cyanide inhibits the ability of your blood to transport oxygen. I’ve been eating apple seeds ever since I can remember as well as my older brother. I even once competed with my older brother which one of us can eat more apples in an hour and that included eating seeds as well (just the inside of the seed – white stuff not the brown shell). If I remember correctly I had 42 and he ate 47 apples and all of the seeds. Now when I calculate how many seeds did we consume, well lets assume that each apple had 8 seeds on average times 40 apples that’s 320+ seeds each, thats about half a coffee mug of seeds if not more. I have to admit the both of us had bad stomach aches but that was because of 40 something apples not because of seeds, and none of the other symptoms of cyanide poisoning that were mentioned in this article . Both of us are still alive and well! I’m 40 and my bro is 47 y.o.! Hmm, I might be addicted to that stuff when I think of it!!! I’m not sure how you see that as an argument against their toxicity. Many chemotherapeutic substances are highly poisonous. If you are implying the cyanide compound in the seeds is only active against cancer cells, I believe you are mistaken. 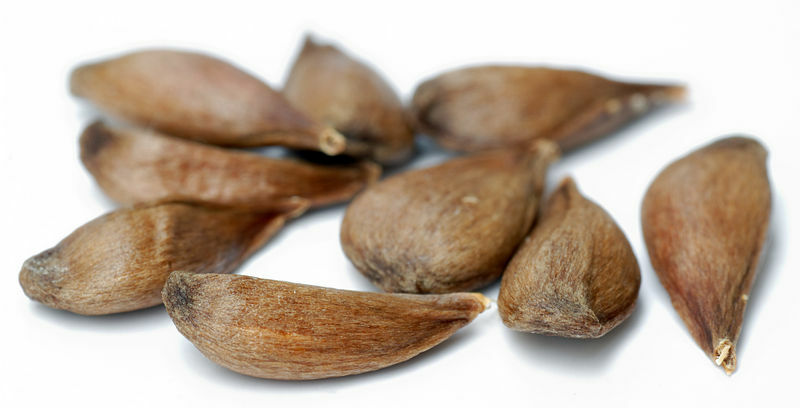 People die every year from eating too many of these seeds. Is it possible cancer cells are more susceptible to the toxin than healthy cells? Certainly, but that doesn’t mean it’s categorically safe to eat the seeds. Lets see a link to even ONE confirmed death by apple seeds. Totally It’s hilarious how anybody could think that consumption of a ubiquitous natural compound in moderation could kill you… Blinkered belief in orthodox medicine propaganda.. if it wasn’t so tragic that would be more hilarious. I have to agree with you stormy, this is pure BS. This is actual research that took place at sloan kettering with apricot seeds/ B17/LAETRILE…..Nobel prize winner Dr. Kanematsu Sugiura believed it worked. Confirmed@truth. All cancers could be cured – much of our economy is based on false pretenses -misguided information – and much of it regulated by the FDA. The same way with our OIL – we really could have cleaner energies – we will NOT change until we ARE FORCED to do so – and then, I am afraid it will be TOO LATE. GREED! GREED! GREED! Eh? What is this “people die every year” stuff? The AMA report that always comes up when anyone talks about apple seeds reports on a single case of fatal seed poisoning. Am I saying people should eat apple seeds constantly? No (although I eat the whole apple, which includes the seeds–though without chewing them). But “people die every year” seems rather… alarmist, ne? read this somewhere years ago. My God women….do some real investigative reporting!!! a bunch of them. But then again, it seams like eating anything in large quantities will kill or make you real sick. Example, Salt….Your body needs it….eat to little and you will get sick….eat to much and you will Die….its kind of like that. Also, for the bible thumpers, like me. It says in several places to eat the fruits, nuts and SEEDS of the earth. For a last thought. Try, just try and find any research that has been done on what quantity of cyanide is in apple or appricote seeds. I dare you. Anyway we’ve been doing this for months, and the seeds should be more poiseness when chewed or blended. dark-blood-hoe-suicidal-emo-69 your a dirty troll who lives under a crappy bridge, bugger off. i eat the seed and have been since primary school when a kid dared me to eat them and then told me they were poisonous. Also i think it was 1.7kg every day for years before you started to see side effects not including death. Also trolls stink like rotten apples. To much of a good thing can be bad. Fyi to all of you. 2 cheery seeds can kill a human. “Takes 0.1 grams of cyinite to kill a 150 pound human” guess whaf “0.17 grams in a cheery seeds” one/two is enougj to kill a person. Now thats if you chew the impossible to chew seeds you can swollow them no problem but if you chew into them and eat the poweded stuff. Well lets say the medics will be there shortly. Along with a nice coffin for you. Hydrogen Cyanide will kill you, not the much more complex molecule contained in the seeds. Any substance has a lethal dose. Cancer cells can turn the molecule into poison, however, a healthy cell will be fine. When I was four years old I spent the afternoon under an apple tree eating little green apples. I passed out from lack of oxygen and was taken to the hospital. The doctor couldn’t find anything wrong so he sent me home. After arriving home, I again could not get any air in my lungs and again, passed out. This time at the hospital the doctor asked what I had eaten that day. When I confessed to having eaten “a bunch of little green apples”, the doc knew right away what was wrong. This was 52 years ago. I truly believe that a few more of those seeds would have indeed killed me. I still remember the panic I felt from not being able to breathe. (Deby Peterson “little green apples”) Cyanide does not work that way. It sounds more like you were involved in an allergic episode in relation to these “little green apples”. Cyanide is a killer. If you pass out do to cyanide ingestion, there is no saving you. You are on a one way trip. Anyway; I have eaten 5 cherry kernels(seeds) each day for the last 2 days, and I have suffered none of the tell-tell signs of cyanide toxicity: sleepy, hard to think, pain in muscles, weakness, bad vision, vomiting, headaches, or death. I take cherry seeds because I believe as other do that this small dosage of a naturally occurring cyanide aids the body in stopping the replication of rogue cells. I don’t think it fights pre-existing cancers but rather should be thought of as a immunological booster for those who have had family members who have been diagnosed with cancer in the past. There have been scientific studies that show that when you eat these seeds (apple, cherry, apricot, etc.) your blood will show elevated cyanide levels, but this level will be much higher in tumors. So, you don’t need a lot. A whole apple, seeds and all in a smoothie twice a day should be fine. I think the important factor here is sustained low levels and not spikes. For the record: Apple seed deaths are hard to authenticate, but apricot and cherry seed deaths are real and a point of medical record (most of these cases are cancer patients that were thinking… if a little is good then more should be better… WRONG). What these records usually omit is the accurate quantify of seeds that resulted in death. This is what I believe leads to the hysteria that promotes the “never eat apple, apricot, cherry seeds or you will die”. For the record: There is no magical unlocking enzyme in cancer. But there is a density of cellular activity driven by the availability of cholesterol wherever tumors grow. This density is because tumors are not symbiotic. Tumors are parasitic and steal everything they are from your bodies. If it is in the blood then tumors want it 10x as much. New studies are looking into statin drugs to lower the availability of cholesterol to slow down aggressive tumors and starve out slow growing ones. Cyanide is toxic however so is sodium and chloride (or chlorine) however you most definitely have the latter two everyday! Sodium chloride is the chemical name for salt! Yep that stuff you put on your food. So go figure out the cyanide in the seeds…. Dose makes the poison! I am 40 yes old, I have known that many seeded/pitted fruits contain cyanide, but they are only poisonous if they are broken/chewed, while apples are considered the most dangerous to especially children and pets this is do to the fact it’s more likely if eatened they are likely to be chewed up and swallowed (not whole causing the potential lethal dose to be fully released). As far as the woman who said she eat cherries pits and all, growing up, as long as the pits are swallowed whole, there was never any danger to her, then or now, for no poison would have been released. And for the Natzi’s committing suicide with cyanide capsules, this is very true, but does anyone know how these capsules were made? Well, from what I was told by my great grandfather (he was from Germany, but considering he was Jewish, I doubt that he would have been a Natzi), he told me that they saved the pits and seeds of fruits they ate, deshelled them, and then crushed them into a powder, then using the powder to fill the capsules. Leafy Greens, if improperly or unwashed these leafy vegetables can carry potentially deadly parasites, bacteria and other micro organisms. How would heat treating an almond get rid of a substance like cyanide? That claim is likely false. Hate to be the conspiracy guy, but I think the “heat treating” is simply used to break the bonds of the existing, beneficial, molecular structure that exists in the almonds to prevent their full potential as a medicinal food from being reached. Almost all food is better for you in the natural state. I once ate two whole apples. INCLUDING their seeds and felt nothing. At all! So, I think this is bunch of crap! You have to chemically separate the compounds to get Cyanide. Steve McQueen was a Hollywood star who went to Mexico to get the cyanide treatment for his cancer in the 1950’s. It did not work and he died quite awfully. Doesn’t work, my brother-in-law is following some Internet treatment for cancer and is dying just as fast. Expect to bury him in a month or so. Told my poor sister to get the various powers of attorney and have the will reviewed. Sorry dudes, the conspiracy theory is not quite the level of MK-Ultra on this cyanide thing so grow up. I watched an episode on unsolved mysteries a few years ago that made me aware of Apple seed poisoning, a lab assistant got his girlfriend pregnant but didn’t want to continue in the relationship or having children. She was found dead.a few years later they uncovered his journal he had hidden. Exumbed her body,found the compound still in her body.of course he was than arrested and sentenced too life. I crush open cherry pits with a hammer to get the soft, bitter seed out of the center and chew it up. Very bitter, but that’s just the amygdalin which is healthy for you. Every time I cut up an apricot for a smoothie, I bust open the pit to get the almond shaped seed out and I chew it up and eat it too. I may eat two of those a day and four or more cherry pits a day. Every time I cut up an apple for a smoothie, I remove the seeds and chew them up too. Been doing this for years and years because of the health benefits of amygdalin with no side effects whatsoever. People don’t die from eating this stuff. The cyanide in these things only hurt cells that do not contain the enzyme rhodanese. Healthy cells contain this enzyme and break down cyanide into harmless molecules. The only cells in the body that do not contain rhodanese are cancer cells and when amygdalin comes in contact with a cancer cell, it is broken down into glucose, hydrogen cyanide and benzaldehyde. The latter two trigger aptosis (programmed cell death) in cancer cells hence killing it. At least, that’s the theory. There are tons of people who report success with this therapy simply from eating apricot pits that they bought online. You’d quite literally have to eat them like candy to get side effects and even if you did, you’d feel minor effects long before you died which would signal you to slow down. Besides, you guys do know they SELL apricot pits for people to buy and eat, right? Go look on Amazon and there’s even a website for Apricot Power products. All this crap about them killing you is complete nonsense that has been perpetuated over and over again by people who don’t bother to really check facts. thank you for spreading truth. I also enjoy my peach and other bitter pit seeds. It’s sort of an acquired taste, but knowing the benefits makes the difference. People must stop confusing a prevention method for a cure, however. They can kill you. Especially apricot kernels. Wikipedia offers peer reviewed references. A scientific study showed that 8 ounces of apricot kernels contains enough poison to kill an adult human. I’m glad that I stumbled across this discussion. The other day I cracked open a cherry pit and took the seeds and planted them in the hope to grow something from them. for some reason I wanted to see what they might taste like. They do indeed have a wonderful almond taste. As cat-nip is to cats; Almond paste is to Dutch people. Being Dutch, I thought that I found A new way to make Almond paste to bake with. Wow! that could have been problematic. I have a cherry tree and make lots of wonderful thing with the cherries, so I get plenty of the pits. Along with canning and Bake goods, I make Cherry Mead. I was thinking about adding some of the cherry seeds all mashed up to my next batch of Mead. Wouldn’t that have been a disaster! Thanks to everyone for their input. Using your mind as a filter, do some independent research on this matter from several different scientific publications and see if you still believe these things can hurt you. Ground cherry pit is used alot in tradional Greek – Middle Eastern cooking mainly baking a variety of breads. Has a distinctive flavour and quite delicious. I need your help, I’ve heard that citrus fruit seeds have cyanide….I’ve been eating a lot of orange, lemon and mandarin seeds. will this affect me or my health in anyway? How many people replied to this without reading the whole thing? Everyone repeating what was said here then acting like the article was bs need to improve their reading comprehension. Several plants, including almond and tapioca contain small amounts of cyanide. There’s a reason why even people using bitter apricot seeds for cancer suggest not eating more than a couple over a 24 hour period… That’s because about 50 in a day (chewed or ground) can kill you. Remember that this may be a LD50, meaning this dose will only kill about 50% of people who intake it. Regardless, cyanide has killed MANY people. Anyone who doesn’t believe this should talk to a holocaust survivor who’s family and friends were murdered in gas chambers using cyanide gas (and then please shut your mouth while they talk). Thank you! Peoples ignorance is so infuriating. I’m glad there are still some literate people in the world. I’ve called poison control, they weren’t allowed to tell me any real numbers, but they suggested I don’t call back unless I’ve ingested more than 10 crushed cherry pits. You could count the amount of deaths from eating too many apricot seeds over the last 100 years on one hand and still have fingers left over. It is extremely rare and even those taking it for cancer can work their way up to eating dozens a day with no side effects whatsoever. If apple seeds, stone fruit pits, berry seeds (strawberry, blackberry, blueberry etc..), almonds and various nuts, fruits, spinach and various vegetables and other edible plant parts containing amygdalin were fatal, there would have been an epidemic a long time ago. People are not dying from amygdalin. There’s a huge difference between amygdalin and being poisoned with straight cyanide; HUGE. These pits don’t even contain cyanide; the body metabolizes it into a weak cyanide compound that is broken down into harmless molecules UNLESS it comes in contact with beta-glucosidase which is only found in cancer cells. The body is also capable of building a tolerance to it. No one will be cured of cancer VIA amygdalin eating only “a couple” every day; try more like a couple dozen or more. Not all at once, but over 4-5 doses throughout the day which increase steadily over time. Two kernels a day won’t do a damn thing for cancer. I and many others would have been dead a long time ago if these things were so harmful; they’re not. It doesn’t happen and there’s zero evidence that it does on anything other than an EXTREMELY rare basis. It is so rare as to be an insignificant risk no matter how much you try to compare eating amygdalin to a holocaust gas chamber which is pretty hilarious by the way. Care to exaggerate any more? There’s more cyanide in vehicle exhaust smoke than in dozens of these pits, so how is anyone still alive? The body is perfectly capable of handling small amounts of cyande and it is also perfectly capable of developing tolerance over time. The body can even turn cyanide into Vitamin B12; it can and does adjust. Stop with the scaremongering already. I’ve actually tried to use this method to kill myself. Instead of apple seeds I used Cherry Seeds which is said to be more potent. I blended up 50+ of them and used them in a smoothie which didn’t go down well and nothing. At best I got a little headache. I wish there was a better source. I eat one or 2 apples a day and am disappointed if I eat an apple and find few or no seeds. I always seek out the seeds and pit them swallowing the pulp and throwing away the shell. Cortland has a good average of 8-12 seeds. Just had a Paula red with 14 seeds. Been doing it for a long long time I am 76. Naturally all the idiots can’t understand that they have never eaten enough seeds in a short enough time to have a problem. I first heard this drivel about ‘cyanide’ being a ‘cure’ for cancer back in the 1970’s. It was garbage then and it’s garbage now. Mb and all the others who think that there is somehow a government conspiracy to prevent people from knowing about ‘cancer cures’ are deranged. In the first place cancers are so widespread and cost such huge sums of money in lost productivity that if there was an easy to find cure to hand then you can be sure that big pharma would be marketing and selling the hell out of it. Secondly the idea that the ‘government’ want to see widespread cancer as a ‘population control’ is frankly bizarre when condoms and birth control pills and all sorts of other contraceptives are easily available. It is even more risible when you consider the constant efforts of legislators to restrict access to abortion. Cyanide is not a ‘cure’ for anything and in large doses will either kill you or make you too ill to function normally ever again. Im nervous I have to share the same public spaces with you people. Conspiracies for every little thing and eating seeds just to try to prove them wrong. Jet fuel can weaken steel beams and cherry seeds contain compounds that can kill you if you eat a bunch of them. If you drink too much salt water you’ll die. Go test that conspiracy. The government may just be trying to sell us bottled water for the tax money with that lie. First of all: It’s amygdalin, not cyanide that’s in the seed. So the amount of cyanide from 1 pip is less than the amygdalin it contains. Furthermore, I’ve seen other articles using different numbers. The guardian talks about 2.1mg amygdalin per seed weight 0.7g (3mg/g of seed). That’s less than half the amount per seed used in this article. This is in accordance to Wikipedia: 0.3% amygdalin per 0.7g seed. As you can see, amygdalin is much heavier than cyanide. Rounded up it’s about 17.6x heavier. The Wikipedia article, apricot, seems to use this number when calculating the amount of cyanide produced by amygdalin. But since we want to be on the safe side lets round this number down to 17. So, it’s 18 apples * 17 = 306 apples per day. That’s quite something. According to the guardian’s 2.1mg per seed, this is times 2 is 612 apples. Times 8 is 4896 seeds. As The Guardian states, “You need to eat a huge number of apple seeds to succeed in poisoning yourself.” And according to this reporter, (in 2015) there were NO known cases of someone succeeding in doing so. The Guardian also states that it takes a minimum of 1.5mg/kg body weight to kill a person, not 1mg. So let’s calculate the numbers given by The Guardian. The Wikipedia states that 0.6mg cyanide is the allowable daily amount, while 1.5mg/kg is deadly. Calculating with 0.6mg/kg it will take 43 apples or 344 pips crushed and ingested to kill you. All of this is assuming one can divide amygdalin by 17 to get cyanide (molar mass equation). My second observation: The math used in this article seems manipulated. 1mg cyanide per kg body weight instead of 1.5mg cyanide. 70mg cyanide / 0.49mg cyanide(amydalin) per seed * 0.7gr weight of seed = exactly 100g of seeds. 100g apple seeds / 0.7mg weight of seed * 0.49mg cyanide(amygdalin) per seed = exactly 70mg of cyanide(amygdalin).